U.S. jets targeted terror mastermind Abu Musab al-Zarqawi, pounding one of his suspected hideouts Friday in Fallujah in a strike U.S. officials said killed up to 25 people. Iraqi leaders warned of more insurgent attacks after a wave of bloodshed blamed on al-Zarqawi, and said they were considering drastic measures to combat the violence — including declaring martial law or a state of emergency in some areas.
. There are reports that former Iraqi generals have joined forces with Sunni militants and foreign terrorists to launch devastating new attacks. "It's the people who want us to take stronger measures," said interim Defense Minister Hazem Shaalan. "We have to be patient. Building democracy requires patience." President Bush traveled to Ireland, in preparation for a NATO summit next week in Turkey. He will seek more aid from European nations to help in Irag's transition. Western advisers completed their handover of Iraq's remaining government ministries to Iraqis on Thursday, six days before the end of the U.S.-led occupation. Iraqi ministers now oversee more than 1 million government workers. Spc. Sabrina Harman, a soldier accused in the Iraq prisoner abuse scandal, appeared Thursday for the military equivalent of a grand jury hearing, the U.S. command said. American troops in Iraq would remain immune from prosecution in local courts after the occupation officially ends, under an agreement in principle between the United States and the interim government in Baghdad. 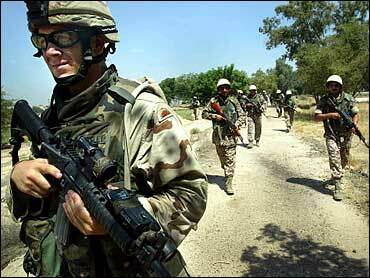 Eight British troops who were detained in Iran flew back to southern Iraq on Friday after stopping briefly in Kuwait. President Bush said it was not likely that NATO countries would contribute additional troops to Iraq, but added in an interview broadcast Friday that he was hopeful that some countries would help train Iraqi forces. Some 138,000 U.S. troops are in Iraq, along with far smaller units from 31 other countries, including 16 NATO members. The probe into who leaked the name of a CIA operative — married to a former diplomat who exposed a flaw in the Bush administrations' case for the Iraq war — to a journalist moved to the highest level of government as federal investigators spent more than an hour with Mr. Bush. Al Gore on Thursday accused Mr. Bush of lying about a link between al Qaeda and Saddam Hussein and said the president refuses to back down from that position to avoid political fallout. Some influential Muslim clerics who had been sharply critical of the American occupation spoke out Friday against the bloody attacks of the previous day, which killed more than 100 people, most of them Iraqis. Three American soldiers were among the dead. "What sort of religion condones the killing of a Muslim by another Muslim?" asked Sheik Abdul-Ghafour al-Samarai, of the influential Sunni group the Association of Muslim Scholars, during a sermon in Baghdad's Umm al-Qura mosque. "We must unite and be heedful of those who want to drive a wedge among us under the cover of Islam." Sheik Ahmed Hassan al-Taha said at Baghdad's al-Azimiya mosque, Iraq's foremost Sunni place of worship, that "it makes me sad to see that all the victims yesterday were Iraqis." The Friday airstrike was the third against al-Zarqawi's network in Fallujah in a week, and it came as U.S. tanks exchanged fire with militants on the outskirts of the city, 40 miles west of Baghdad. U.S. and Iraqi officials say al-Zarqawi's al Qaeda-linked movement was behind highly coordinated assaults Thursday against police stations and other buildings in five cities. A claim of responsibility in al-Zarqawi's name was posted on an Islamic Web site. "With God's help we will pursue these people and keep the Iraqi people safe," the defense minister, Shaalan, told reporters. "The time has come for a showdown." U.S. and Iraqi authorities have long predicted that the insurgents would seek to derail the transfer of sovereignty, set for Wednesday. Several strong explosions were heard early Saturday in central Baghdad but the origin was unclear. Friday night, six mortar shells exploded near the Green Zone headquarters district of the U.S. occupation, the military reported. There were no reports of casualties. A bomb also went off outside the home of an Iraqi deputy defense minister, though no one was hurt, the military said. U.S. officials estimated 20 to 25 people were killed in Friday's strike in Fallujah. Omar Majeed, 40, who lives in the neighborhood that was attacked, said missiles struck a house that was vacated by the owners the day before. Al-Jazeera television, in a report from Fallujah, said U.S. missiles struck a vacant house but the blast injured four people next door. The report could not be confirmed. Al-Zarqawi, a Jordanian-born militant, has also claimed responsibility for kidnapping and beheading American businessman Nicholas Berg and South Korean hostage Kim Sun-il. But a senior administration official acknowledged that intelligence about al-Zarqawi's network was limited. "I don't think we have, really, any idea how broad it is," the official said, speaking on condition of anonymity. He added that al-Zarqawi likely has "some kind of command and control" role. Al-Zarqawi was known to have had a "small but very lethal network" but now may be working with other groups of fighters," the official said. "It's a little hard to know whether what's really happening is that you have networks that are being joined together." Coalition officials believe Fallujah has become a center of the insurgency and Islamic extremism since the U.S. Marines abandoned their siege of the city in late April and handed over security to an Iraqi force, the Fallujah Brigade. That security transfer is widely seen now as a failure, because control has fallen into the hands of hardline Muslim clerics and their fanatical followers. U.S. commanders believe al-Zarqawi is planning a wave of car bombings in Baghdad, said Col. Michael Formica, commander of the 1st Cavalry Division's 2nd Brigade. New U.S. military checkpoints have been set up around the city of 5 million people, and large numbers of Iraqi National Guard troops in combat fatigues and body armor were deployed into the streets and main squares Friday. "We expect there will be more attacks," Interior Minister Falah Hassan al-Naqib said. Violence across the country diminished Friday from the day before. One Iraqi policeman was killed and another wounded by a roadside bomb that exploded in a Baghdad residential district. In the northern city of Mosul, fearful residents largely kept off the streets, after four devastating car bombs Thursday killed nearly 50 people. No decision had been reached about imposing martial law, but Iraq's interim vice president warned it might be necessary, however undesirable. "In normal situations, there is clearly no need for that," Ibrahim al-Jaafari, a Shiite and member of the Islamic Dawa Party, told The Associated Press. "But in cases of excess challenges, emergency laws have their place." Any emergency laws would fall within a "democratic framework that respects the rights of Iraqis," he said. It's not clear whether American officials support martial law. The U.S. military, with 130,000 troops in Iraq, has the primary security role even after the transfer of sovereignty, under a U.N. Security Council resolution approved this month. Washington's eventual exit strategy from Iraq is predicated on strengthening Iraqi security forces — who so far appear ill-equipped to do the job. In Thursday's attacks, outgunned Iraqi police failed to hold positions in Mosul and Baqouba after a wave of car bombs and attacks by black-masked gunmen brandishing rocket launchers. American troops joined the battles with aircraft, tanks and helicopters and finally repelled the guerrillas, allowing Iraqi security forces to regain control. Meanwhile, Shiite fighters loyal to radical cleric Muqtada al-Sadr announced a cease-fire in Baghdad' Sadr City neighborhood, scene of frequent clashes with U.S. troops.